Thanks to Publisher’s Weekly, we have a great recap (along with some terrific photos) of the Openly YA Tour! 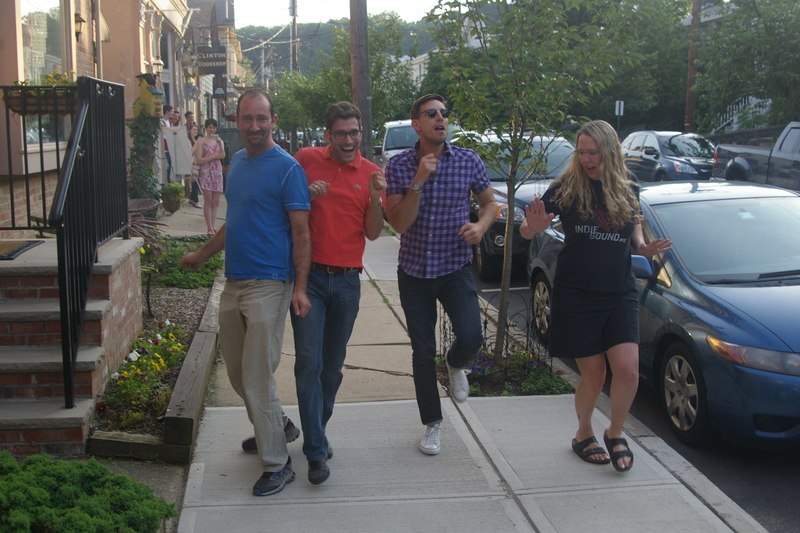 Yes, that would be me prancercizing with Alex London, Aaron Hartzler, and A.S. King. Rob Dougherty at Clinton Book Shop requested it, and who were we to say no? Actually it was a lot of fun. There is a video, and you can see it here if you scroll down. Thanks, Sara, for posting that. What can I say? Spending a week with David Levithan and the boys (and Amy King, who joined us in Clinton, N.J.) was good for my soul. Each one of them is a terrific person and a terrific writer, and the best thing that I can say about this wonderful week is that I truly felt that we were not competing with each other. It really felt like we were supportive of each other through the whole thing, and that’s not so easy to find in this world. For a week, we were family. So yeah, buy their books, please. Even if I didn’t love those guys as friends, I’d love them each as writers. So, so good. So there you have it. Will there be more of the tour? Yes. Definitely at YALLFest in South Carolina in November, and at the Texas Book Festival in September. Hopefully some other places, too, if we can figure out how to schedule it and pay for it.